This post is part of a series on problems I’ve encountered with financial advisers and my day 6 blog post for the #YourTurnChallenge. Awhile back, I was approached by an online brokerage company about considering the use of an outside portfolio manager. The broker had developed a list of approved firms and I spoke with a few of their representatives. 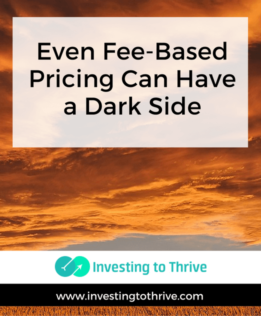 One represented the dark side of paying a fee for assets under management (AUM). Let me start by discussing the concept of portfolio management. A portfolio manager manages investments by making decisions on a client's behalf in regard to asset allocation; selection of stocks, mutual funds, ETFs, bonds, etc. ; and rebalancing. Typically, a client will pay a percentage of the dollar amount of assets under management (AUM) for this service. There may also be charges for transaction fees required to implement the portfolio-management strategy. The idea of such an arrangement is that as a client's wealth grows so do the earnings of the outside firm managing the client's portfolio. For example, if an adviser starts by managing $200,000 in assets for a 1% AUM fee, then the annual fee collected by the adviser is $1,000. If the assets are grown to $400,000, then the annual fee collected becomes $2,000. The financial success of client and adviser, then, are tied together. However, in some cases, the strategy to bring more assets under management doesn't involve creating more wealth for the client. [By the way, at the time that I was approached with this offer, there weren't many companies that the average person could access for portfolio management. Many required a minimum of $250,000 for such services, or as much as $10 million. Today, though, there are many portfolio management arrangements available to the average investor. Betterment offers such a service, investing your money in a diversified portfolio according to your time horizon and risk tolerance. Many traditional firms providing portfolio management offer this capability as part of their more comprehensive wealth management services. Generally, a wealth management firm employs a wide range of financial professionals with expertise in portfolio management, estate planning, taxation, and risk management. Often, a financial planner acts as the quarterback for the team, coordinating activities related to the client's needs. This point person may also be a sales person, perhaps one with licenses to sell securities and insurance products. The concept of a wealth manager or portfolio manager was new to me, but one that made sense for investors who don't have the time or energy to manage investments on an ongoing basis. As I investigated this possibility, I learned of the dark side of paying for portfolio management based on assets under management. It started with an odd experience with one of the recommended firms. The main contact was a financial adviser who had held senior-level positions with prominent and prestigious financial institutions. We had two lunch meetings and several email exchanges. The first time we met at a restaurant of my choice near my office. The restaurant had limited menu options and so I wasn't surprised (or disturbed) when the financial adviser followed my lead and ordered the same item as I did. But at the second session, at a larger restaurant with a much broad offering, he again ordered what I did. Worse, he finished his meal at the exact same moment as I did. I suddenly felt like I was in an Alfred Hitchcock movie, creepily being stalked and hunted by a smiling predator in a pin-striped suit. Further, when I opened the conversation with a tidbit about this adviser's business partner (who joined us for this second meeting), I discovered that I had been given false information. And, instead of apologizing for his mistake, my main contact looked at me as if I was wrong to bring up a piece of family trivia. (Note: what I lack in social skills, I make up for in memory.) At this point, I decided to refuse subsequent face-to-face sessions. Still, I allowed the firm to provide me with a proposal via mail. The recommendation involved a complex arrangement to protect me from owning a concentrated position and speed up the sale of a large position of stock so that the firm could accelerate the process of bringing my assets under its management. This pitch was the opposite of what I had been originally told about the firm's approach directly by the adviser. Also, and more to the point, the strategy could have moved my holdings from long term to short term, potentially triggering income that would now be taxed at ordinary income rates (associated with short-term capital gains) rather than more favorable long-term capital gains rates. This difference in rates could range from 15-35%. So, if I adopted this recommendation, I could pay at least 15% more (and as much as 35% more) in taxes as compared to a more simplistic strategy of say, steadily reducing my position and snagging low tax rates associated with long-term capital gains. Now what bothered me is that the proposal mentioned “capital gains” tax but not the exact nature of those taxes. The information was technically accurate but misleading as an important material fact was omitted. A more precise explanation would have been appropriate, given the potentially dramatic difference in taxes. So, in this situation, the adviser seemed to be reducing the size my portfolio in order to bring more assets under management. I realized that the financial adviser would simply draw upon his relationship skills to soothe my pain when I realized what had happened to my money. Complex strategies could be useful but I need to understand them and their tax consequences. Just because an adviser has been referred to me from a trusted source doesn't mean that the adviser can be trusted. Many financial advisers know more about sales and relationship management than investment management. Trust my gut; and be sure to have more than one encounter with someone before entrusting my money to an adviser. Not all portfolio managers are predatory. But this one showed me that some financial advisers seek to dominate an investor, not to grow the investor's wealth.